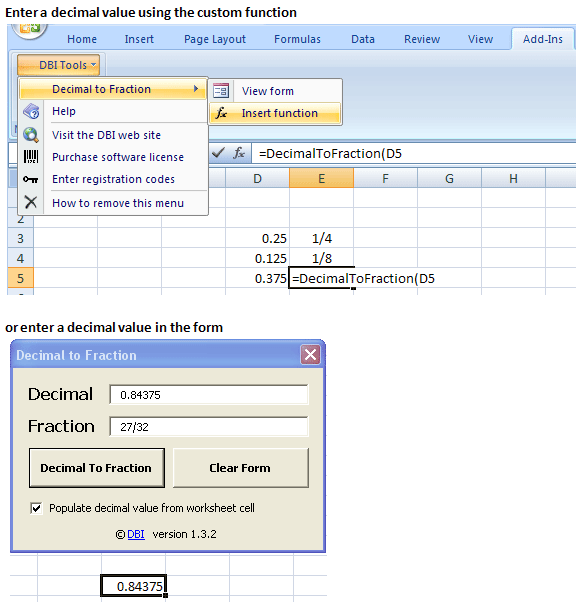 Microsoft Excel tool that calculates the fractional equivalent of a decimal value. Decimal to Fraction is easy to use. Just enter a decimal value in the windows form or use the custom Excel function. Works with Excel 2000 2002 2003 2007. Last update 24 Jun. 2009	Licence Free to try	| $4.95	OS Support Windows	Downloads Total: 1,028 | Last week: 0 Ranking #181 in Office Add-ins Publisher Digital Banquet Inc.